< In order to ensure compatible data sharing between the DCS supervisory layer and DCS partition, an EPICS Process Variable Gateway is required to be implemented by each PANDA DCS partition. 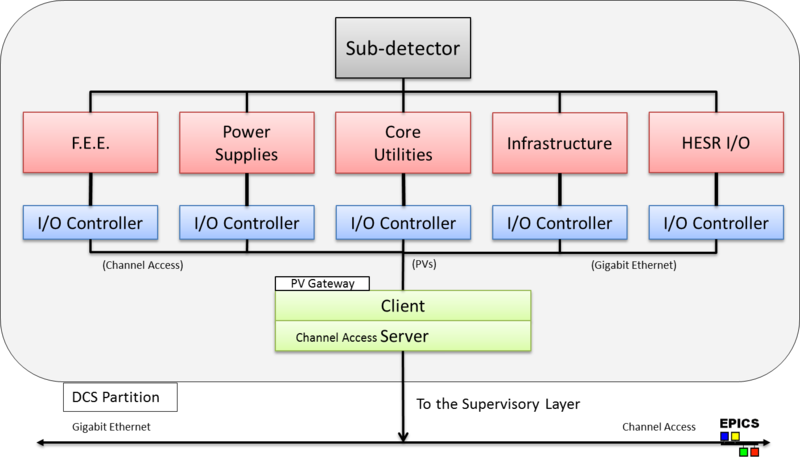 Additionally, the PV Gateway will provide access rights administration and subnet interface. > In order to ensure compatible data sharing between the DCS supervisory layer and DCS partition, an EPICS Process Variable Gateway is required to be implemented by each PANDA DCS partition. Additionally, the PV Gateway will provide access rights administration and subnet interface. < To gain write access to this wiki, you have to be a member of the PandaControlsGroup. This is also required for being able to upload your talks to the TalksArchive. If you want to become a member of the PandaControlsGroup, ask its coordinator MarioBragadireanu. > To gain write access to this wiki, you have to be a member of the PandaControlsGroup. This is also required for being able to upload your talks to the TalksArchive. If you want to become a member of the PandaControlsGroup, ask its coordinator Florian Feldbauer. The PANDA SC subgroup has been formed in 2007. The subgroup is basically made by people, from different PANDA collaborating institutions, involved in the slow controls of the experiment, chaired by the SC sub-system manager. The most up-to-date list of DCS members can be found here. The present subgroup chairman is Mario Bragadireanu. > The PANDA SC subgroup has been formed in 2007. The subgroup is basically made by people, from different PANDA collaborating institutions, involved in the slow controls of the experiment, chaired by the SC sub-system manager. The most up-to-date list of DCS members can be found here. The present subgroup chairman is Florian Feldbauer. attr="" comment="DCS interrelations graph (small)" date="1196957713" name="DCS_small.png" path="DCS_small.png" size="63756" user="DanProtopopescu" version="1.1"
attr="" comment="DCS components (small)" date="1207780246" name="DCS-LayersDAQ-wbg-small.png" path="DCS-Layers+DAQ-wbg-small.png" size="114286" user="DanProtopopescu" version="1.1"
attr="" comment="DCS components (small) with AFECS" date="1252090282" name="DCS-LayersDAQ-generic-w-small.png" path="DCS-Layers+DAQ-generic-w-small.png" size="228756" user="DanProtopopescu" version="1.1"
attr="h" comment="How to write your own slow controls" date="1323954477" name="DCS-HOWTO.png" path="DCS-HOWTO.png" size="1276908" user="DanProtopopescu" version="1.1"
attr="" comment="How to write your own slow controls (with links)" date="1323955064" name="DCS-HOWTO.pdf" path="DCS-HOWTO.pdf" size="1524515" user="DanProtopopescu" version="1.2"
attachment="PandaCentralDCS.png" attr="" comment="" date="1413136125" name="PandaCentralDCS.png" path="PandaCentralDCS.png" size="71653" user="MarioBragadireanu" version="1"
attachment="PandaDCSPartition.png" attr="" comment="" date="1413136271" name="PandaDCSPartition.png" path="PandaDCSPartition.png" size="68318" user="MarioBragadireanu" version="1"
attachment="PandaDCSLayers.png" attr="" comment="" date="1413136408" name="PandaDCSLayers.png" path="PandaDCSLayers.png" size="113227" user="MarioBragadireanu" version="1"
attachment="Requirements_Status_October_4.png" attr="" comment="" date="1507117619" name="Requirements_Status_October_4.png" path="Requirements_Status_October_4.png" size="39500" user="MarioBragadireanu" version="1"
attachment="PANDA_Controls_requirements_STT_detailed.xlsx" attr="" comment="" date="1507118304" name="PANDA_Controls_requirements_STT_detailed.xlsx" path="PANDA_Controls_requirements_STT_detailed.xlsx" size="32760" user="MarioBragadireanu" version="1"
attachment="PANDA_Controls_requirements_MVD_detailed.xlsx" attr="" comment="" date="1507118431" name="PANDA_Controls_requirements_MVD_detailed.xlsx" path="PANDA_Controls_requirements_MVD_detailed.xlsx" size="40065" user="MarioBragadireanu" version="1"
attachment="PANDA_Controls_requirements_Barrel_DIRC_detailed.xlsx" attr="" comment="" date="1508919708" name="PANDA_Controls_requirements_Barrel_DIRC_detailed.xlsx" path="PANDA_Controls_requirements_Barrel_DIRC_detailed.xlsx" size="27154" user="MarioBragadireanu" version="2"
attachment="PANDA_Controls_requirements_FWE_EMC_detailed.ods" attr="" comment="" date="1507118514" name="PANDA_Controls_requirements_FWE_EMC_detailed.ods" path="PANDA_Controls_requirements_FWE_EMC_detailed.ods" size="23299" user="MarioBragadireanu" version="1"
attachment="PANDA_Controls_requirements_FSC_detailed.xlsx" attr="" comment="" date="1507118551" name="PANDA_Controls_requirements_FSC_detailed.xlsx" path="PANDA_Controls_requirements_FSC_detailed.xlsx" size="33341" user="MarioBragadireanu" version="1"
attachment="PANDA_Controls_requirements_LUMI_detailed.xlsx" attr="" comment="" date="1507118576" name="PANDA_Controls_requirements_LUMI_detailed.xlsx" path="PANDA_Controls_requirements_LUMI_detailed.xlsx" size="29804" user="MarioBragadireanu" version="1"
attachment="PANDA_Controls_requirements_v3.xlsx" attr="" comment="" date="1507118646" name="PANDA_Controls_requirements_v3.xlsx" path="PANDA_Controls_requirements_v3.xlsx" size="32239" user="MarioBragadireanu" version="1"
attachment="PANDA_Controls_requirements_Cluster_Jet_Target_detailed.xlsx" attr="" comment="" date="1508428000" name="PANDA_Controls_requirements_Cluster_Jet_Target_detailed.xlsx" path="PANDA_Controls_requirements_Cluster_Jet_Target_detailed.xlsx" size="39577" user="MarioBragadireanu" version="2"
attachment="Requirements_Status_October_18.png" attr="" comment="" date="1508348324" name="Requirements_Status_October_18.png" path="Requirements_Status_October_18.png" size="50454" user="MarioBragadireanu" version="1"
attachment="PANDA_Controls_requirements_SciTil_detailed.xlsx" attr="" comment="" date="1508348607" name="PANDA_Controls_requirements_SciTil_detailed.xlsx" path="PANDA_Controls_requirements_SciTil_detailed.xlsx" size="30464" user="MarioBragadireanu" version="1"
attachment="PANDA_Controls_requirements_Solenoid_detailed.xlsx" attr="" comment="" date="1508793787" name="PANDA_Controls_requirements_Solenoid_detailed.xlsx" path="PANDA_Controls_requirements_Solenoid_detailed.xlsx" size="35995" user="MarioBragadireanu" version="1"
attachment="PANDA_Controls_requirements_Hyp_Ge_detailed.xlsx" attr="" comment="" date="1508793942" name="PANDA_Controls_requirements_Hyp_Ge_detailed.xlsx" path="PANDA_Controls_requirements_Hyp_Ge_detailed.xlsx" size="33448" user="MarioBragadireanu" version="1"
attachment="Requirements_Status_October_24.png" attr="" comment="" date="1508794273" name="Requirements_Status_October_24.png" path="Requirements_Status_October_24.png" size="55090" user="MarioBragadireanu" version="2"
attachment="PANDA_Controls_requirements__EndcapDiscDIRC_detailed.xls" attr="" comment="" date="1508909080" name="PANDA_Controls_requirements__EndcapDiscDIRC_detailed.xls" path="PANDA_Controls_requirements__EndcapDiscDIRC_detailed.xls" size="46592" user="MarioBragadireanu" version="1"
attachment="Requirements_Status_October_25.png" attr="" comment="" date="1508909090" name="Requirements_Status_October_25.png" path="Requirements_Status_October_25.png" size="55179" user="MarioBragadireanu" version="1"
attachment="Requirements_Status_November_10.png" attr="" comment="" date="1511175902" name="Requirements_Status_November_10.png" path="Requirements_Status_November_10.png" size="55829" user="MarioBragadireanu" version="2"
attachment="PANDA_Controls_requirements_Endcap_and_Barrel_EMC.ods" attr="" comment="" date="1511175436" name="PANDA_Controls_requirements_Endcap_and_Barrel_EMC.ods" path="PANDA_Controls_requirements_Endcap_and_Barrel_EMC.ods" size="25071" user="MarioBragadireanu" version="1"
attachment="dcs-fee-interface-draft-68bc99a4.pdf" attr="" comment="Concept Draft for the Interface between the PANDA DCS and the FEE" date="1552446259" name="dcs-fee-interface-draft-68bc99a4.pdf" path="dcs-fee-interface.pdf" size="275044" user="FlorianFeldbauer" version="2"
< In the past, an evaluation of several SCADA development packages ( PVSS, LabView, EPICS) was performed by a PANDA slow controls subgroup and the EPICS package was selected to be the main PANDA SC software development tool. > In the past, an evaluation of several SCADA development packages ( PVSS, LabView, EPICS) was performed by a PANDA slow controls subgroup and the EPICS package was selected to be the main PANDA SC software development tool. attachment="PANDA_Controls_requirements_Barrel_DIRC_detailed.xlsx" attr="" comment="" date="1507118477" name="PANDA_Controls_requirements_Barrel_DIRC_detailed.xlsx" path="PANDA_Controls_requirements_Barrel_DIRC_detailed.xlsx" size="24731" user="MarioBragadireanu" version="1"
< - Luminosity Detector: PANDA_Controls_requirements_LUMI_detailed.xlsx. attachment="PANDA_Controls_requirements_Cluster_Jet_Target_detailed.xlsx" attr="" comment="" date="1508347648" name="PANDA_Controls_requirements_Cluster_Jet_Target_detailed.xlsx" path="PANDA_Controls_requirements_Cluster_Jet_Target_detailed.xlsx" size="38609" user="MarioBragadireanu" version="1"
Muon system Muon system t.b.a. To gain write access to this wiki, you have to be a member of the PandaControlsGroup. This is also required for being able to upload your talks to the TalksArchive. If you want to become a member of the PandaControlsGroup, ask its coordinator MarioBragadireanu. This is the wiki page of the DCS Subgroup. This subgroup has been established during the September 2007 PANDA collaboration meeting at GSI. 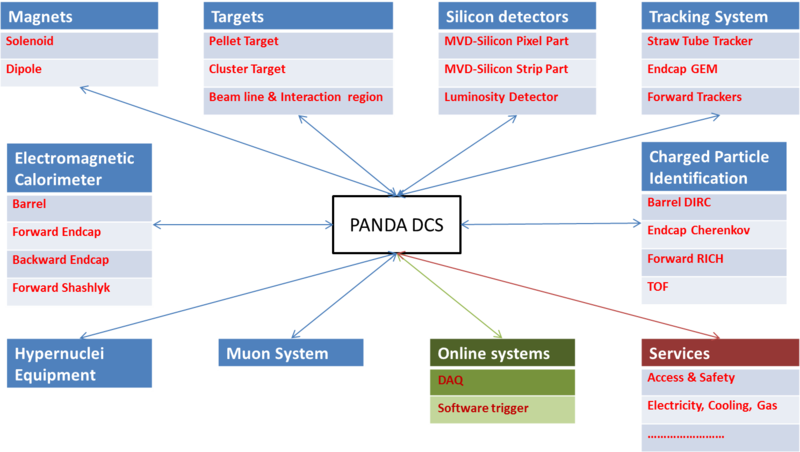 The architecture of the PANDA DCS and the individual components were ready for implementation and deployment, respectively, by the end of 2009. Actual testing, benchmarking, component development and streamlining will happen along with the completion of the detector until commissioning date. To more appropriately reflect its scope, the DCS group should be renamed ECS (Experiment Control System), so for a while, both acronyms might appear throughout the documentation. Members of the DCS group should register to this wiki and be added to the PandaControlsGroup (please email LarsSchmitt with your wiki name to be added). The subgroup chairman at this time is MarioBragadireanu. Past chairman: DanProtopopescu. The most up-to-date list of DCS members can be found either from the DCS_REQ Contacts table or from the DCS mailing list. Subgroup meetings will be announced via the Indico system. Please see our TalksArchive. It is very likely that the PANDA ECS will be a combination of various specialized systems integrated via a high-level framework. AFECS would be the umbrella system that would aggregate the data streams from slow controls, DAQ and online analysis. The EPICS wiki gives some programming specs and guidelines for how to write a simple GUI, send and control parameters, lists tutorials etc. Our requirements database is available here: http://panda-controls.gsi.de/DB/ (its structure is described in DCSRequirementsDB). The detector subgroups should collect and enter (at least preliminary) numbers into this database by the end of 2008. The online interface automatically produces EPICS *.db files based on the information from the databases, and some easy IOC test scripts. SupportedHardware is a wiki describing the proposed/tested/supported sensor/control hardware for the PANDA ECS. Early contributions have the chance to set the standards and significantly help other detector subgroups. Please contribute. It is advisable that the members of the DCS group browse the documentation for EPICS, AFECS and MonALISA. PANDA ECS specific documentation will be linked/attached here as it is written. > Welcome to the home of PANDA DCS wiki. > The DCS subgroup forum is located here. > The PANDA SC subgroup has been formed in 2007. The subgroup is basically made by people, from different PANDA collaborating institutions, involved in the slow controls of the experiment, chaired by the SC sub-system manager. The most up-to-date list of DCS members can be found here. The present subgroup chairman is Mario Bragadireanu. > The DCS mailing list is panda-dcs@gsi.de. < Members of the DCS group should register to this wiki and be added to the PandaControlsGroup (please email DanProtopopescu with your wiki name to be added). > Members of the DCS group should register to this wiki and be added to the PandaControlsGroup (please email LarsSchmitt with your wiki name to be added). < The subgroup co-chairmen at this time are DanProtopopescu and LarsSchmitt. > The subgroup chairman at this time is MarioBragadireanu. Past chairman: DanProtopopescu. from the DCS mailing list. Our requirements database is available here: http://panda-controls.gsi.de/DB/ (its structure is described in DCSRequirementsDB). < Members of the ECS group should register to this wiki and be added to the PandaControlsGroup (please email DanProtopopescu with your wiki name to be added). > Members of the DCS group should register to this wiki and be added to the PandaControlsGroup (please email DanProtopopescu with your wiki name to be added). < The ECS subgroup has been established on September 17, 2007. The present structure is listed below. > The DCS subgroup has been established on September 17, 2007. The present structure is listed below. The subgroup forum is located on the GSI server. < It is recommended that members of the ECS subgroup do subscribe to this forum. > It is recommended that members of the DCS subgroup do subscribe to this forum. < It is very likely that the PANDA ECS will be a combination of various specialized systems integrated via a high-level framework. AFECS would be the umbrella system that would aggregate the data streams from slow controls, DAQ and online analysis. > It is very likely that the PANDA ECS will be a combination of various specialized systems integrated via a high-level framework. AFECS would be the umbrella system that would aggregate the data streams from slow controls, DAQ and online analysis. < The EPICS wiki gives some programming specs and guidelines for how to write a simple GUI, send and control parameters, announcements of tutorials etc. < It is advisable that the members of the ECS group browse the documentation for EPICS, AFECS and MonALISA. PANDA ECS specific documentation will be linked/attached here as it is written. > It is advisable that the members of the DCS group browse the documentation for EPICS, AFECS and MonALISA. PANDA ECS specific documentation will be linked/attached here as it is written. < This is the wiki page of the DCS Subgroup. This subgroup has been established during the September 2007 PANDA collaboration meeting at GSI. The aim is to decide (and have some preliminary trials of) the framework for the PANDA DCS by the end of 2008. The architecture of the PANDA DCS and the individual components will be then ready for implementation and deployment, respectively, by the end of 2009. Actual testing, benchmarking, component development and streamlining will happen along with the completion of the detector until commissioning date. > This is the wiki page of the ECS Subgroup. This subgroup has been established during the September 2007 PANDA collaboration meeting at GSI. The aim is to decide (and have some preliminary trials of) the framework for the PANDA DCS by the end of 2008. The architecture of the PANDA ECS and the individual components will be then ready for implementation and deployment, respectively, by the end of 2009. Actual testing, benchmarking, component development and streamlining will happen along with the completion of the detector until commissioning date. To appropriately reflect its scope, the DCS group will be renamed ECS (Experiment Control System), so for a while, both acronyms might appear throughout the documentation. > Members of the ECS group should register to this wiki and be added to the PandaControlsGroup (please email DanProtopopescu with your wiki name to be added). < The DCS subgroup has been established on September 17, 2007. The present structure is listed below. > The ECS subgroup has been established on September 17, 2007. The present structure is listed below. < It is recommended that members of the DCS subgroup do subscribe to this forum. > It is recommended that members of the ECS subgroup do subscribe to this forum. and provide the date, time and subject. slow controls, DAQ and online analysis. < The heads of the detector groups are in charge of collecting DCS requirements (regarding physics signals, parameters, interdependencies) and liaising with the DCS group. > The heads of the detector groups are in charge of collecting DCS requirements (regarding physics signals, parameters, interdependencies) and liaising with the ECS group. have the chance to set the standards and significantly help other detector subgroups. Please contribute. < It is advisable that the members of the DCS group browse the documentation for EPICS, AFECS and MonALISA. PANDA DCS specific documentation will be linked/attached here as it is written. > It is advisable that the members of the ECS group browse the documentation for EPICS, AFECS and MonALISA. PANDA ECS specific documentation will be linked/attached here as it is written. This is the wiki page of the DCS Subgroup. This subgroup has been established during the September 2007 PANDA collaboration meeting at GSI. < Subgroup meetings will be announced via the Indico system. > Subgroup meetings will be announced via the Indico system. Please see our TalksArchive. < The master archive with talk from all our subgroup meetings is here: TalksArchive. Please attach your talks using your account, such that the author name is visible and easy to search for. > The master archive with presentations from all our subgroup meetings is here: TalksArchive. Please attach your talks using your account, such that the author name is visible and easy to search for. Preferred format is PDF. It is very likely that the PANDA DCS will be a combination of various specialized systems integrated via a high-level framework. AFECS would be the umbrella system that would aggregate the data streams from slow controls, DAQ and online analysis. < and the individual components will be then ready for implementation and deployment, respectively, by the end of 2009. Actual testing, benchmarking, component development and streamlining will happen along with the completion of the detector until commissioning date. > and the individual components will be then ready for implementation and deployment, respectively, by the end of 2009. Actual testing, benchmarking, component development and streamlining will happen along with the completion of the detector until commissioning date. < The subgroup co-chairpersons at this time are Lars Schmitt and Dan Protopopescu. > The subgroup co-chairpersons at this time are LarsSchmitt and DanProtopopescu. > Subgroup meetings will be announced on the PANDA DCS meetings page. The software to be used for teleconferencing is still to be decided. Some suggestion can be found here. It is very likely that the PANDA DCS will be a mashup of various specialized systems integrated via a high-level framework. The liaison person to the GSI/FAIR Controls group is Holger Brand (h.brand@gsi.de). YoungScientists  ... exchange information for young scientists in PANDA. ... exchange information for young scientists in PANDA. attr="" comment="Lars Schmitt's talk, September 2007" date="1190729800" name="LS12-070917_controls07.pdf" path="LS12-070917_controls07.pdf" size="162151" user="DanProtopopescu" version="1.1"
> This is the wiki page of the DCS Subgroup. This subgroup has been established during the September 2007 PANDA collaboration meeting at GSI. Many updates to this wiki are expected over the next few months. WebChanges: Find out recent modifications to the PANDA Wiki.DCS web. WebIndex: Display all PANDA Wiki.DCS topics in alphabetical order. WebNotify: Subscribe to be automatically notified when something changes in the PANDA Wiki.DCS web. WebStatistics: View access statistics of the PANDA Wiki.DCS web. WebPreferences: Preferences of the PANDA Wiki.DCS web. You are currently in the PANDA Wiki.DCS web. The color code for this web is a (SPECIFY COLOR) background, so you know where you are. The subgroup co-chairpersons at this time are Lars Schmitt and Dan Protopopescu. There is a forum (hosted at GSI) and there will be a mailing list. It is advisable that the members of the DCS group browse the documentation for EPICS and MonALISA. PANDA DCS specific documentation will be linked/attached here as it is written. attr="" comment="Peter Zumbruch's talk" date="1190734089" name="PZ14-070917_PeterZumbruch-EPICS_at_GSI.ppt" path="PZ14-070917_PeterZumbruch-EPICS_at_GSI.ppt" size="4927488" user="DanProtopopescu" version="1.1"